The big screens for keeping score at the statehouse have been replaced. The screens aren’t for football scores, but for the “score” that shows whether a bill has enough votes to pass. Lawmakers punch a button at their desk. 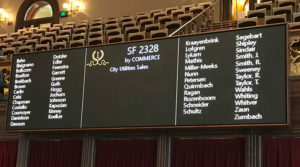 The votes are recorded electronically, then the big screens mounted in the Iowa House and Senate show the vote tally and how each lawmaker voted. Lawmakers have been using voting systems that were installed in 2001. “The software was obsolete to the point where it couldn’t be upgraded anymore and the hardware was difficult to find parts for. We could still find them, but it was becoming more and more difficult, so we needed to do something,” said Carmine Boal, the chief clerk in the Iowa House. Boal led the effort to buy the new systems. On a few occasions in 2017, the old voting system in the House crashed. Boal read the names of all 100 state representatives aloud, waiting for each to cast their vote by yelling “yes” or “no” — so she’s been worried the 18-year-old system would crash for good. “That was a nightmare that I had, so I’m very excited to have that pressure off my back,” Boal said, with a laugh. 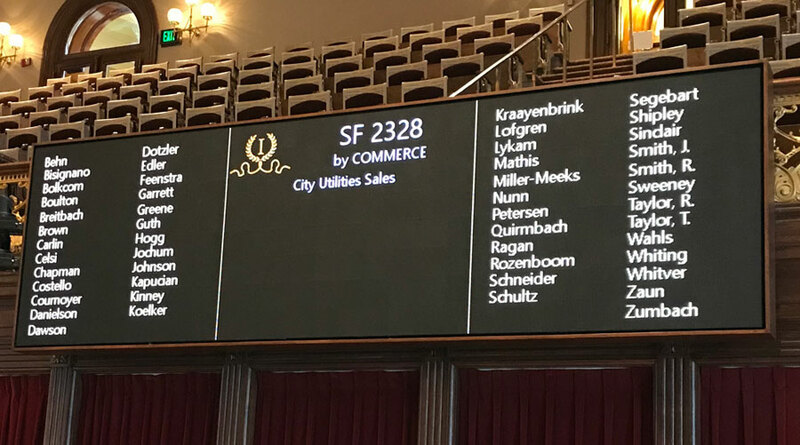 Legislative leaders approved spending about $1.2 million to buy the new voting systems and big screens for the House and Senate. The money is part of what was set aside to repair the capitol’s dome, but that project wrapped up under budget with enough left over to buy new voting systems. Charlie Smithson is the Secretary of the Senate — the person in charge of the voting machine in that chamber. Video can be played on the new screens, but that’s not part of the plan. Lawmakers will start using the new voting systems soon. The 2019 legislative session convenes on Monday, January 14.